For several years, trade shows—technology trade shows in particular—have been in serious decline. From Comdex to E3, large trade shows have been dying out or drastically changing their focus. Even Macworld Expo hasn’t been immune, as the east coast show was canceled after the 2005 event. (The Expo was moved from New York in 2004, and Apple declined to participate in the Boston show that year; the show lasted only one more year before being canceled.) The annual San Francisco Macworld Expo, however, seemed safe from the troubles. For nearly 20 years, the January event has been the one place to see and be seen in the world of all things Apple. With Tuesday’s announcement that the upcoming Expo is Apple’s last, however, that era is coming to an end. While it’s entirely possible the show will survive as a smaller, more-focused version of its prior self, it simply won’t be the huge, all-encompassing event that it’s been with Apple’s participation. Without Apple’s huge booth—and the promise of cool new products delivered in an enthralling keynote presentation—both vendors and attendees probably won’t feel a compelling need to be at the show each January, so we’re not going to see a huge show with thousands and thousands of attendees walking a show floor loaded with hundreds of companies…and that’s really too bad. As a business person, I think I completely understand Apple’s decision—not being tied to a huge annual event, occurring just after the Christmas buying season, is a good thing. Not spending a small fortune on everything involved in participating in a huge trade show is a good thing. Having more flexibility in releasing products whenever you want to is a good thing. Not having to come up with One More Thing every year is a good thing. So really, I get it; it makes perfect business sense. As an individual and Mac enthusiast, though, I think it’s one of the worst things to happen to the Mac community in many years. Don’t get me wrong—I’m not saying this will have a negative long-term impact on Apple. There may be some short-term pain, but I do think it really is the right business decision (that doesn’t mean I agree with it, just that I understand it). But for the community that surrounds the Mac, this is truly the end of an era. The most-affected group, I think, will be the Mac fans who made the annual trek to the Expo. Speaking as one of those folks—yes, it’s my job to go, but I still have a blast going—I’ll definitely miss the keynote, the One More Things, the cool new products (not just from Apple but the other vendors as well), and that great psychological kick I get from seeing the show every year. But those aren’t the things I’ll miss the most. Instead, what I’ll really miss is the once-a-year chance to meet with people who I would otherwise never get to meet in the flesh. 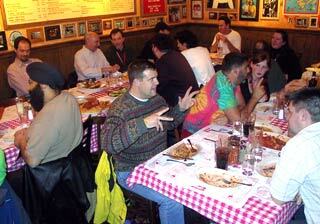 When I ran macosxhints.com as an independent site, for example, I hosted a “Mac OS X Hints reader dinners” during Expo week in 2005. I had the chance to meet and talk to about 30 macosxhints.com readers who previously were only screen names and e-mail addresses to me. Converting those meaningless data items into real people, and spending a few hours talking with them, was priceless, and well worth the effort involved in setting everything up. I also have friends from other places that I will only see at Expo—a buddy in London, for instance, or developer friends from various corners of the planet. During the year, iChat and e-mail were our only contact. But at Expo, we’d have the chance to sit down together and catch up in person. As a speaker—I’m giving my “Best of Mac OS X Hints” talk again this year—I’d also run into people in the speaker’s lounge who I rarely if ever talked to during the year. And yet, because we were Mac users, we were able to sit down and start talking again as if were just yesterday (and not a year ago) when we last talked. In the Expo of the future, sans Apple, I fear such meetings are all but done; the attendees at such a show won’t come from all over the globe, and to even draw from around the country, there will need to be some very compelling reasons for people to fly in. Without Apple, it’s hard to imagine far-flung attendees and developers finding enough reasons to attend and/or exhibit, given the costs involved. Time will tell, of course, but it seems that my annual chance to catch up with some of my electronic acquaintances in real life has now passed. The other group that will really feel the impact of Apple’s announcement are small developers. As a small developer, exhibiting at Expo presented the opportunity for great success. Sure, you needed to have an excellent product with an eye-catching booth to grab some attendee attention…but if you had that, you could find your product taking off in a big way, as the 50,000-plus attendees who had the chance to try out your product at Expo flew home and spread the word of your greatness. We’ll see that in the upcoming Expo, of course, with those who've already made their plans for the event. Looking forward to 2010, though, I think many developers (large and small) will be hesitant to spend the money to exhibit, knowing that Apple—and the crowds and publicity it brings to the show—won’t be there. So while Macworld Expo was really the one annual chance for small developers to make a name for themselves with an excellent product, I think 2009 is the end of the road for that opportunity. For the developers, and for myself and my fellow members of the Mac community, I really hope that Macworld Expo finds a way to survive and thrive in the post-Apple era. I’d love to have a must-go reason to attend Macworld Expo 2010, knowing the all the developers will be there with their cool products, and my friends will be there for the conference and to see said developers. Unfortunately, it seems to me that Macworld Expo is now like a mall that’s lost its large anchor tenant. While the mall may continue to operate for some period of time, the number of shoppers will decline, smaller retailers will fold up shop, and—eventually—the mall will close with a whimper, leaving people only with memories of what used to be. I hope that’s not the future for Macworld Expo, but I fear that it is.